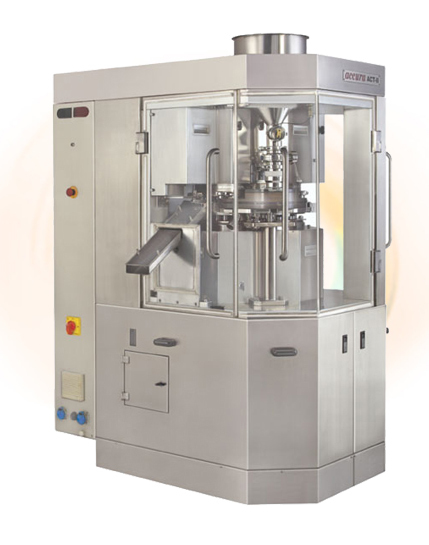 SINGLE ROTARY TABLET PRESSES WITH EXCHANGEABLE TURRET. With Motorized dozzer, for precise depth of fill adjustment. With Auto sampling based on, either time or revolution or Punch no. Turret Can be changed within a very small time segment. Reduces the product change over time. Provide accurate weight & tablet quality. Auto Lubrication on Specific Points & Grease Lubrication on other points. No Hydraulics, No Oil, No Oil Leakage. 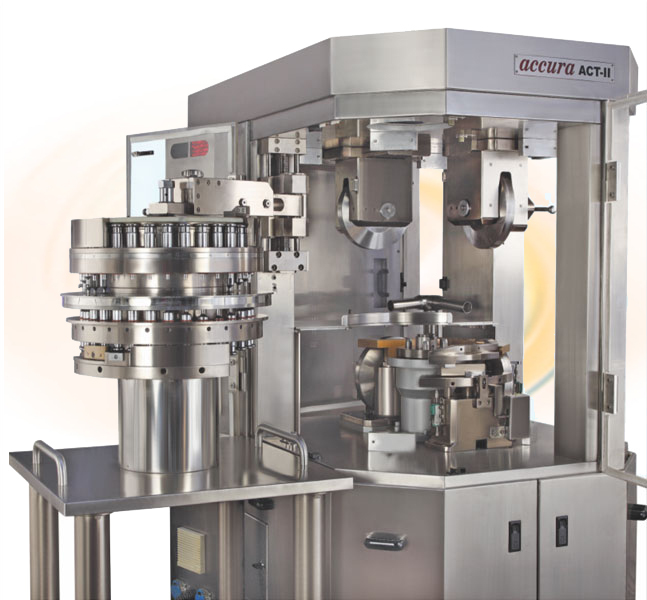 Turret Change / Exchange Looking to the increasing demand from pharma Industries, for this type of mechanism, Fluidpack’s ACCURA ACT – II single rotary Tableting Machine is manufactured / Crafted with great precision and with easy & specially designed turret device, It can be operated through the soft push button on Touch Screen. Keeping in mind the highest safety for machine there are upper & lower limits, on the travel range of the turret lifting rail, which prevents any damage caused by the non- proper operation. Turret is lifted up & down, from the top of it, by connecting it with a cantilevered, lifting linier sliding rail mechanism. Turret, then after, can be pulled out and can be unloaded on specially designed trolley. Another Turret can be immediately replaced by this mechanism on the machine with a very small time segment. Visual indication on safety messages. The Batch data can be recorded automatically & down loaded. The information of product can be recorded & saved under a file name. The display and recorded data can be printed also. The data can be stored. The range of AWC is divided such as control, reject and data store. Graphical appearance of the value of pre & main pressure. Display of figure and graph both for the value of pressure on each individual punch. Indication / Display, of any no. of the selected punch & the respective value of pressure applied on it. Filling depth can be adjusted, if the amount of filled powder is exceeded or shortened beyond preset value. The faulty tablet will be rejected automatically. All data like production, rejection samples taken. Batch time segment etc. is recorded. Discharge chute with three compartments like initial reject, auto reject & sampling gate. The set parameters and the actual parameters can be visualized on the screen, at the same time. Connectivity to any type of Printer.